Achillea is a summer-flowering herbaceous perennial that forms short-lived but colourful clumps in the border. A member of the daisy family, it has broad, packed heads of small flowers that can reach 10cm in diameter. Our native Achilleas, or yarrows, have white flowers, but there is a wide range of summer-flowering species and cultivars available that come in yellows, oranges, pinks and reds. The foliage is an attractive feature of the plant, and most types have silvery-grey or green feathery leaves that are finely dissected and almost fern-like in appearance. The wild yarrow has the name A. millefoilium, which means ‘thousand-leaved’ in Latin. The foliage can also be quite sweetly aromatic, and is sometimes likened to the strong scent of chrysanthemums. Being clump forming and generally low-growing, many types can be used as ground cover, though some verge on being invasive on their favoured dry soils. As all good scholars of ancient Greece are aware, Achillea originally sprang from the blood of the hero Achilles, who was killed at the siege of Troy. Achilles’ soldiers used yarrow to treat wounds on the battlefield, giving rise to the various alternative names such as ‘All Heal’ and ‘Bloodwort’. The plant’s medicinal associations continue today, and it has many claimed homeopathic benefits in addition to its healing qualities for cuts and abrasions. Achilleas find a place in many types of garden design, and sit just as well in contemporary prairie planting or in groups of three or five in a dry gravel bed as they do in a quintessential old English cottage garden. They are perfect for mixed borders as the flowers and foliage provide a good contrast against other herbaceous plants, especially if planted in drifts flowing through groups of other plants in the middle of the border. The dwarf varieties are useful for the rock garden, and they can also be grown with herbs and as companion plants on the edge of vegetables beds, where they will attract beneficial pollinating insects. This article looks at the range of Achilleas that can be grown in the garden and provides useful information on how to keep them refreshed and looking at their best. Achillea millefolium is the common yarrow, which grows wild in many types of grassy habitats in the UK and elsewhere in Europe. It bears heads of small white flowers, often tinged with pink, from June to September. Its feathery, deeply cut leaves give it the name ‘millefolium’, or thousand leaf. Achillea sibirica, the Alpine yarrow, has white or soft pink flowers in spring over green, spear-shaped leaves. It makes good ground cover and is particularly attractive to beneficial pollinating insects. Achillea argentea has white flowers in spring and silvery leaves. It is very low growing and useful for dry sandy soils and rockeries. 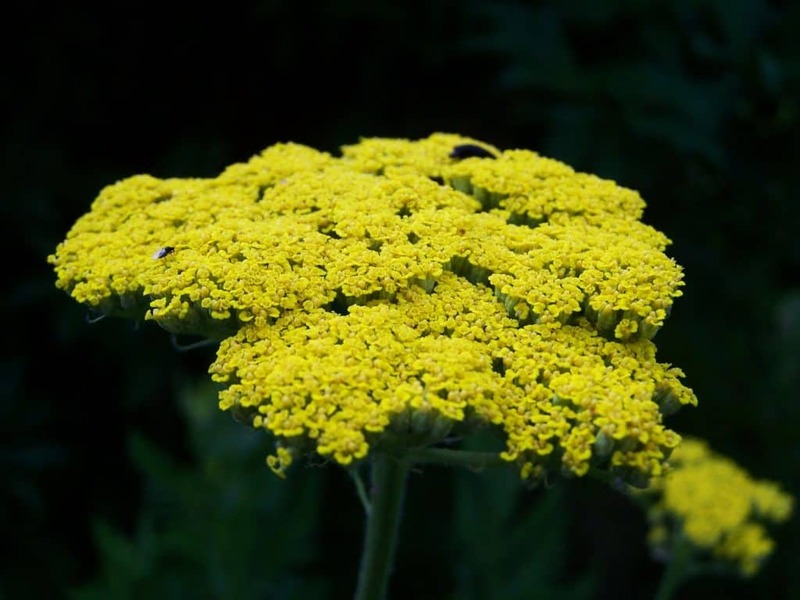 Achillea chrysocoma is a yellow-flowered, low-growing plant with attractive grey leaves. Achillea tomentosa also bears yellow flowers in the spring but has downy grey-green leaves. It is a good ground cover plant, and does not grow above 15cm in height. Achillea clypeolata has silvery, woolly leaves and bright, rich yellow flowers from June to August. It grows to 20cm tall, and makes a good rockery plant. Achillea filipendulina is a tall species with fern-like leaves. Its long-lasting, yellow blooms appear from June to September. They make excellent cut flowers and are also good for drying. The plant grows to 1.5m tall and can spread up to 1m. Achillea nobilis subsp. neilreichii is another sun-worshipping Achillea with a repeat flowering habit. It is spreading and low-growing and will thrive in the very driest conditions. The ferny foliage is smooth and grey-green, while the flower is creamy yellow. A wide variety of Achillea cultivars are available, ranging from tall to dwarf types, and in a range of bright and pastel colours, including terracotta, red, cerise, orange, yellow and white. Achillea filipendulina ‘Coronation Gold‘ has dense heads of small yellow flowers. It is evergreen, and offers all year-round interest through its attractive feathery, grey-green leaves and excellent architectural and textural qualities. Achillea ‘Moonshine’ is one of the most popular garden varieties. It has soft, silvery-grey leaves and masses of branched, bright sulphur-yellow flower heads throughout the summer and into early autumn. It reaches a height of 70cm and a spread of up to 50cm. It makes an excellent cut flower. Like many of the Achilleas, it will do well for three or four years, but then become woody at the base. When this happens, the plant needs to be lifted and replaced. Achillea ‘Walther Funcke’, is a warm orange Achillea that reaches 30cm in height. Achillea ptarmica ‘The Pearl’ produces loose clusters of double white flowers in the height of summer. A. serrata is similar to A. ptarmica, but with single flowers. Achillea x lewisii ‘King Edward‘ has fern-like, grey-green leaves and flat heads of yellow flowers. It is low growing, up to 15cm, and is useful for difficult, dry sandy soils. Achilleas are easy to grow and provided they have been planted in an appropriate sunny, well-drained spot they will require no special attention once they are established. They are quite tolerant to exposure and will even grow well along the coast despite being subjected to strong sea breezes. Before choosing a final position for a new plant, examine the leaf. In general, the green-leaved Achilleas prefer good loamy soil and bright positions, though they will also thrive in slightly shadier parts of the border in amongst taller plants as long as they do get some sunshine for parts of the day. Varieties with silver or grey leaves do better in lighter, very well-drained soils in positions that get full sun throughout the day. Some of the taller varieties can become a little top-heavy when in full bloom, so they can be staked or supported with stakes and twine or metal border hoops to keep them tidy. Achilleas do best in full sun. Most species come from dry grassland habitats and they can tolerate dry conditions in the garden. Once established, they rarely need watering except in the very driest summers. They will not survive in waterlogged conditions. Achilleas are not particularly fussy about soil, and they will do well on any light, open soil. They will deal with slightly acidic sandy soils and thrive on chalky loams. They do less well on heavy clay, though they will tolerate such conditions as long as a decent amount of grit is mixed into the soil before planting. Alternatively, gardeners with heavier clay soils can plant them into raised beds with a gritty soil. In less than ideal soil conditions, always plant them out in the spring rather than later in the year to avoid any chance of winter waterlogging as they establish. They are not hungry plants and they do not need routine feeding in normal garden soils. Achilleas do not require pruning, but they should be cut for the vase or dead-headed regularly to extend the flowering season. The plant can be cut down to ground level in the autumn for tidiness, though many gardeners enjoy seeing the architectural seed-heads in the border over-winter. These can be cut back in early spring as new growth begins. Most gardeners buy their Achilleas as pot-raised plants for planting out between October and March for a full floral display in the summer, but it is possible to raise plants from seed or softwood cuttings, or to divide young but established clumps before they become woody. Seed can be sown in the open in spring, between late March and early April. Choose a sunny position, prepare the seedbed to a fine tilth, water the area well, and then sow the seed thinly. After sowing, cover the seed with very fine soil and only very lightly, as the seed needs some light to germinate. It is best not to water again for a day or so, and then to mist rather than water heavily, to avoid washing the seed away before it has settled into the soil. Once germinated and large enough to handle, thin the seedlings to 45cm centres. Seed can also be sown in February or March onto the surface of moistened seed compost in pots or trays kept in a bright, unheated greenhouse or cold frame. Keep the container covered with plastic until the seed has germinated. Young plants raised in this way should not be planted out until all danger of frost has past. The best time to take softwood stem cuttings from Achilleas is the late spring, though some success may also be achieved with cuttings taken through the summer. Use a sterile, sharp knife to take suitable 5cm to 10cm softwood cuttings of new and healthy stems that have three or four growing points. Insert these around the edges of pots of a well-drained mix of peat-free cutting compost and vermiculite. Keep the compost moist but not over-wet, and put the pots in a cold frame or propagator at 10°C to 15°C, or cover them with supported plastic bags and keep them at around that temperature in a bright, sheltered spot. Once roots have formed, the new plants can be transplanted into a sunny border. Established clumps can be divided when the plant is dormant, generally in the autumn or early spring. This not only produces additional plants, but also extends the life of short-lived but popular varieties such as ‘Moonshine’. These need to be divided and replanted every three to four years as they become woody, unless new plants are going to be bought in. A vigorous but established clump should be carefully lifted, and young growth pulled away from the main clump ensuring a ‘heel’ is taken with it. These pieces should be inserted into trays or individual 75cm pots containing a well-drained compost such as John Innes No. 2. If kept in a sheltered position, cold frame or unheated greenhouse, they will root very quickly, and will be ready for planting out into the border within a month. Spring-divided plants will be ready to plant out in the summer, while plants from divisions undertaken later in the year can be kept in the pot in a cold frame over winter for planting out in the spring once frosts have past. Achilleas are generally trouble-free and will generally look after themselves. They can be susceptible to attack by aphids, though the damage to the plant is seldom serious. It is also not uncommon to find the ‘cuckoo-spit’ of froghopper larvae on the plants. Whilst the juvenile insect is sucking the plant’s sap to create this and to feed itself, the process will seldom cause major damage to the plant unless it is on a shoot tip, which can become distorted. Any badly affected part can be removed and disposed of. Achilleas can also suffer from powdery mildew, though this is rarely a problem for plants grown in ideal sunny, dry and well-ventilated situations. Q My friend has an attractive pink-flowered perennial in her mixed herbaceous border that she calls ‘thousand leaf’. Is this the same as yarrow? With it classical Greek connotations, a natural distribution around the northern hemisphere and a long history of use in traditional and herbal medicine, it is perhaps no surprise that Achilleas have one of the longest list of alternative common names of any garden plant! In addition to your friend’s thousand leaf, these include little feather, milfoil, nosebleed, plumajillo, gordaldo, herb militaris, soldier’s woundwort, thousand-seal, noble yarrow, yarrow, yerw, field hop, arrowroot, bloodwort, stanchweed, sanguinary, woundwort, carpenter’s weed, death flower, devil’s nettle, old man’s pepper, gearwe and snake’s grass. Q Would Achilleas make good cut flowers for my indoor vase arrangements? Yes, some gardeners grow varieties of Achillea such as A. filipendulina ‘Coronation Gold’ and ‘Moonshine’ in their dedicated cut-flower beds to produce both fresh and dried flowers for floral arrangements. To prepare dried flowers, pick the heads of one of the flat-headed varieties such as Achillea filipendulina when they are in prime condition with the later flowers still emerging from the bud, and certainly before the first few flowers begin to fade. Do not use any diseased or pest-damaged stems. Bring them indoors to dry as soon as possible after picking. Hang loose bunches upside-down in a cool, dark, dry and well-ventilated place. Use a tight rubber band at the base of the stems to hold the bunch together, as they will shrink in diameter as they dry. The process generally takes three to four weeks. Q Can you give me any design tips for using the yellowy-orange yarrows in a mixed herbaceous border? Achilleas are fantastic for bringing a border planting together if they are planted in long, sinuous drifts around clumps and groups of other, taller plants. All Achilleas blend well with grasses such as Molinia and Stipa, and also clusters of Alliums, while the yellow and orange varieties work well with other orange perennials and with purple-flowered plants with silvery grey foliage. Crocosmia ‘Lucifer’, Rudbeckia and Zinnia will provide strong complementary oranges. For good contrasting purples to use as foreground planting in front of Achilleas, try English lavender, purple sage and one of the low-growing hardy geraniums such as ‘Rozanne’. You can also try close planting with the more subtle shades of pale yellow foxgloves and Phlomis russeliana to enhance the texture and presence of the Achilleas. Q Is it worth me making my own yarrow essential oil for medicinal purposes? Yarrow yields a naturally dark blue essential oil. It is extracted by steam distillation of the flowers, so if you have the right equipment and a lot of plants, it should be possible to make your own oil. Alternatively, it is available commercially from a wide variety of suppliers for around £10 for a 5ml bottle. 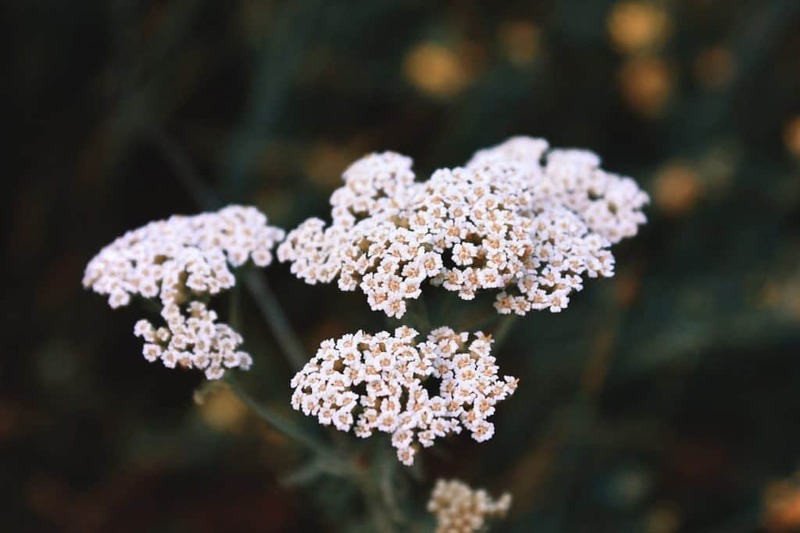 Aromatherapists say that yarrow essential oil has many therapeutic benefits, including anti-inflammatory and antispasmodic properties that can ease stiff joints and muscle cramps, and an ability to ease the symptoms of colds and flu when used as a chest rub. They also use it in skin care, where it is said to have an astringent effect that helps to reduce oiliness and dullness whilst also providing protection against bacterial infection. In herbal medicine, the flowers are used as an anti-allergenic to treat various mucus-related problems, including hay fever. Infusions, tinctures and teas made from the flowers are also said to be effective for the relief of phlegm in the upper respiratory tract, and the flowers can be used to make external skin washes and rinses that are claimed to be helpful in the relief of eczema. As Achilles knew well, the leaves encourage blood clotting, and they were traditionally recommended as a remedy for nosebleeds.